The city’s 25 most expensive office towers all average asking rents of more than $100 per square foot, and the highest floors at three towers top $200 a square foot, according to a new report from brokerage JLL. 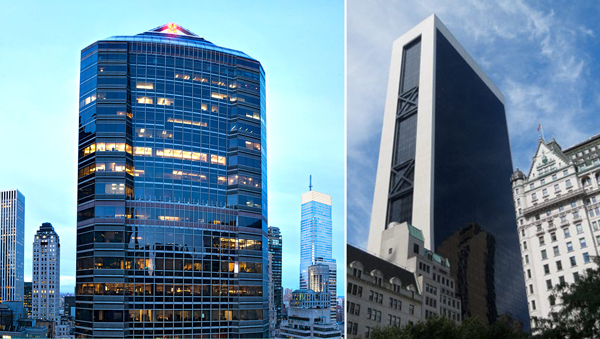 Tishman Speyer’s 520 Madison Avenue, the Blackstone Group’s Park Avenue Tower at 65 East 55th Street and Sheldon Solow’s 9 West 57th Street all topped $200 in asking rents, the brokerage said. Meanwhile, the asking rent for the most expensive Plaza District buildings rose by 4 percent since September to $144 per square foot, the New York Post reported. According to JLL, strong demand from financial firms like hedge funds is pushing rents up. One of the largest high-end spaces on the market is at One Columbus Circle, where Time Warner is freeing up 1.8 million square feet as it moves to Hudson Yards. The asking rent at a large block of space there is $155 per square foot.